If you missed the beginning of the ice cream series, you can find it here. I think I probably used one banana too many, and that accounted for the excess volume. Still, the result is very satisfactory! The taste is very much like fresh bananas. The color is like that of the inside of a banana, not bright yellow like some commercial banana ice cream. It's not terribly photogenic, but what it lacks in visual appeal, it makes up in flavor and consistency. You might be able to see that I swirled a bit of chocolate syrup through this part of the ice cream. This ice cream experiment has been an exercise in compromise, as well. To the banana ice cream I would have added chocolate chips and walnuts; my husband wanted to leave it plain and add toppings later. We compromised by adding a chocolate syrup swirl to the smaller half-batch. For the coconut ice cream, I would have gone with coconut fudge or coconut almond fudge ... but DH, ever the purist, asked for it to be left plain. I did it his way, because he's much more of a coconut fan than I am. So for coconut ice cream, we adapted this recipe. Since the cream of coconut that I purchased was in two smaller cans, I multiplied the recipe by about 1-1/4 to use all of it. It was easy to mix up, but when we churned it, we found that the coconut pieces were getting stuck on the dasher of the ice cream maker. 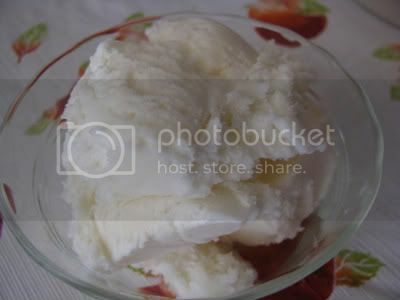 As a result, the finished ice cream contains some clumps of coconut. We've also made another batch of mint chip ice cream (my son's favorite) with heavy cream--no substituting lowfat milk this time! It's wonderful, but we don't have photos yet. I'll try to take one before the container is empty! The next flavor we're trying is coffee, based on the recipe in How to Cook Everything . Fresh-ground coffee is steeped in hot milk, which is strained and used as part of the liquid base. The ingredients are nothing more than coffee, milk, sugar, heavy cream, and vanilla extract. I tasted the mixture and have high hopes for this ice cream! We purchased two quarts of heavy cream at a warehouse store, where we paid roughly half the price that we'd pay in our supermarket. I've been tempted to purchase cookbooks of ice cream recipes. But I've found numerous recipes online and in the recipe book that came with the ice cream maker. Maybe at some point we'll choose to buy a cookbook, but for now, we're using the recipes that are available for free! Disclosure: This post contains one Amazon Associates affiliate link (the cookbook title). The Banana one sounds really YUMMY especially with the ripple of chocolate! 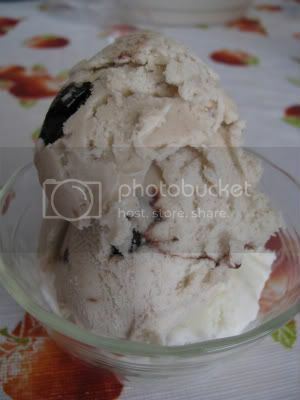 I would love to try to make a banana split ice cream. I have an ice cream maker I should give it a whirl. One of these days I'm going to get an ice cream maker. Oh my gosh, coffee is my favorite ice cream flavor! I'll be very interested to hear about that one.